“It will tell us a lot about the moon,” Worden told me. When America returns to the Moon with the LADEE spacecraft blasting off shortly before midnight Sept. 6, it could potentially be watched by many tens of millions of spectators – weather permitting – along the US East Coast stretching from Maine to the Carolina’s and into parts of the Midwest. See launch visibility map below. And the science timing for LADEE’s lunar mission is just perfect as well since several countries and corporations are gearing up to dispatch a batch of new orbiters and landers to Earth’s nearest neighbor that could change its character forever. The purpose of LADEE’s trio of science instruments is to collect data that will inform scientists in unprecedented detail about the ultra thin lunar atmosphere, environmental influences on lunar dust and conditions near the surface. The couch sized probe is built on a ‘modular common spacecraft bus’, or body, that could be implemented on space probes to explore a wide variety of targets in the solar system. “We think the modular bus is a winner,” Worden explained to Universe Today. LADEE is NASA’s first ever planetary mission to launch from the Eastern Shore of Virginia at NASA’s Wallops Flight Facility on Wallops Island. The blastoff is expected to draw large crowds. Some local hotels are already sold out. The Lunar Atmosphere and Dust Environment Explorer (LADEE) Observatory is NASA’s next mission to the Moon. It thunder’s to space at 11:27 p.m. Friday, Sept. 6, from launch complex 0B at NASA’s Wallops Island facility and the Mid-Atlantic Regional Spaceport (MARS) atop the maiden flight of the new, solid fueled Minotaur V rocket developed by Orbital Sciences Corp.
And change is inexorably coming to the Moon rather soon. “The Chinese plan to land on the Moon by year’s end,” Worden elaborated. LADEE is the first spacecraft of any kind that’s been designed, developed, built, integrated and tested at NASA’s Ames Research Center in Moffett Field, Calif.
“This is our first complete mission built out at Ames,” Worden explained. “It’s also the first of a new paradigm where we are trying to develop a low cost modular bus design. The approach on LADEE was to make it a mix and match modular bus – rather than a singular modular bus. “So we have modular slices that use a propulsion stage, lander stage, communications stage, science payload stage, bus housekeeping stage and more,” Worden told me. And the Ames modular bus has definitely sparked entrepreneurial interest. “The bus is already an approach being used by at least one of the Google Lunar X-Prize competitors! The Moon Express team has looked at it a lot to transition that capability to them,” Worden explained. How about future NASA missions? “The LADEE bus is also a key part of several of our Ames proposals for future planetary missions,” Worden replied. I asked if it could deploy a small rover too? “Yes- a small, micro rover is possible, perhaps 10 to 20 inches in size. And you could pack a lot of science on the small rover using today’s technology! Thus there are numerous exploration possibilities – all dependent on the Federal budget for NASA in this extremely difficult fiscal environment. NASA Ames had “built parts and spacecraft components and science instruments before, but not a spacecraft in the entirety and in house,” Worden told Universe Today. For example, a few years back Ames built the LCROSS lunar impacting spacecraft that smashed into the Moon’s south pole and discovered a treasure trove of water ice. LCROSS piggybacked as a secondary science mission payload onto NASA’ s Lunar Reconnaisannce Orbiter (LRO) when the duo launched from Cape Canaveral, Florida atop an Atlas V rocket. NASA Ames has now taken the next step – having designed and built the whole LADEE spacecraft from beginning to end. “This is our first real baby. It’s very exciting,” beamed Worden. And remember that NASA has a 2nd historic launch from Wallops slated for Sep. 17 – with blastoff of the Orbital Sciences Antares rocket and Cygnus cargo carrier bound for its 1st flight to the International Space Station (ISS). Be sure to watch for my continuing LADEE and Antares mission reports from on site at NASA’s Wallops Launch Pads in sunny Virginia – reporting for Universe Today. A spectacular nighttime blastoff blazing a historic trail to the Moon is set to soar in two weeks time when NASA’s LADEE spacecraft lifts off from the Eastern Shore of Virginia at NASA’s Wallops Flight Facility on Wallops Island – from America’s newest spaceport. NASA’s Lunar Atmosphere and Dust Environment Explorer (LADEE) Observatory will thunder to space at 11:27 p.m. Friday, Sept. 6, from the commercial Mid-Atlantic Regional Spaceport (MARS) launch complex 0B at NASA’s Wallops Island facility atop the maiden flight of the new, solid fueled Minotaur V rocket developed by Orbital Sciences Corp.
LADEE’s late night launch will be absolutely spectacular and visible to tens of millions of spectators up and down the US East coast and interior areas stretching into the Midwest- weather permitting. “I love this mission,” said John Grunsfeld, NASA Associate Administrator for Science at NASA Headquarters, at a media briefing today, Aug. 22. “With NASA’s prior LRO and GRAIL spacecraft we studied the Moon’s surface and interior. Now with LADEE we study the atmosphere and dust,” said John Grunsfeld. The small car sized LADEE lunar orbiter mission will be historic in many ways. It’s the first probe of any kind ever launched to beyond Earth orbit from NASA Wallops, as well as being the first planetary science mission from Wallops. It also marks the first launch of a five stage rocket and the first launch of a decommissioned Peacekeeper missile from Wallops. The first three stages of the Minotaur V are based on the nuclear armed Peacekeeper ICBM intercontinental ballistic missile built during the Cold War – now retired and refurbished by Orbital for peaceful uses. Its literally beating sword into ploughshares. Recently, I had an exclusive tour and photoshoot up close and personal with the upper stages of LADEE’s Minotaur V rocket at Wallops prior to integration at the commercial launch pad – 0B – and will be reporting on that here and in upcoming stories. “LADEE is equipped with three science instruments to study the atmosphere and dust and a lunar laser technology demonstration,” said Joan Salute, LADEE program executive, NASA Headquarters. These include an ultraviolet and visible light spectrometer that will gather detailed information about the composition of the tenuous lunar atmosphere; a neutral mass spectrometer to measure variations in the lunar atmosphere over time; a laser dust experiment that will collect and analyze dust particle samples; and a laser communications experiment that will test the use of lasers in place of radio waves for high speed dad communications with Earth. “The lunar atmosphere is so thin that the molecules never collide,’ said Sarah Noble, LADEE program scientist, NASA Headquarters. Scientists also hope to solve a mystery dating back nearly five decades to the Apollo moon landing era, by determining if electrically charged lunar dust is responsible for the pre-sunrise horizon glow seen by the Apollo astronauts and also by the unmanned Surveyor 7 lander, according to Noble. “This is the first NASA mission with a dedicated laser communications experiment,” said Don Cornwell, mission manager for the Lunar Laser Communications Demonstration, NASA’s Goddard Space Flight Center, Greenbelt, Md. I asked when we could see laser communications implemented on future NASA spacecraft? “A new laser communications system could possibly be used on the 2020 Mars rover from the surface of Mars,” Grunsfeld told Universe Today. The couch sized 844 pound (383 kg) robotic explorer was assembled at NASA’s Ames Research Center, Moffett Field, Calif., and is a cooperative project with NASA Goddard Spaceflight Center in Maryland. The spacecraft is a first of its kind vehicle built from a NASA Ames-developed Modular Common Spacecraft Bus architecture that can be applied to other missions. The mission cost is approximately $280 million. The Minotaur V will boost LADEE into a highly elliptical orbit. Then over the next 23 days, as LADEE orbits Earth 3.5 times, the Moon’s gravitational field will increase the perigee of its orbit. The spacecraft will fire its on-board braking thrusters to achieve lunar orbit. Video caption: This animation is a representation of lunar orbital insertion for LADEE, which is the path the spacecraft follows when it is captured by the Moon’s gravity and enters lunar orbit. Credit: NASA Ames/Dana Berry. Note: Animation is silent with no audio/music track included. The mission will fly in a very low science orbit of about 50 kilometers altitude above the moon. The science mission duration is approximately 100 days. “It’s limited by the amount of onboard fuel required to maintain orbit,” Doug Voss, launch manager, Wallops, told Universe Today. 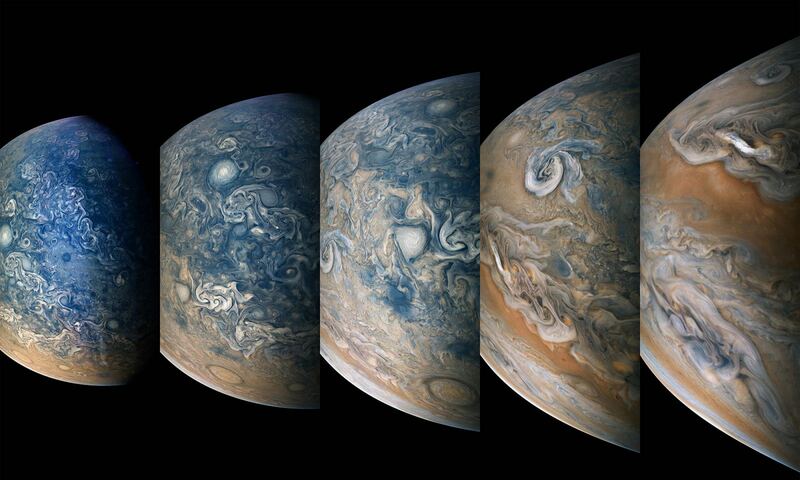 “I’m excited about the night launch because people up and down the Atlantic seacoast will be able to see it,” Jim Green, Planetary Science Division Director at NASA HQ, told me. And don’t forget that NASA has a 2nd really big launch from Wallops slated for Sep. 17 – with blastoff of the Orbital Sciences Antares rocket and Cygnus cargo carrier on their historic 1st mission to the International Space Station (ISS). I’ll be on site at Wallops for both historic launches on Sep. 6 and 17 – reporting for Universe Today. We’ll see you in Virginia! In a fitting testament to NASA’s momentous Apollo Moon Landing Program, NASA and billionaire Jeff Bezos confirmed today (July 19) the discovery of a powerful F-1 first stage engine component from the Saturn V moon rocket that launched three American astronauts on the historic journey of Apollo 11 to land the first two humans on the Moon on July 20, 1969. “On the eve of the 44th moonwalk anniversary, the Bezos Expedition confirms an Apollo 11 Saturn V F1 engine find,” NASA officially announced on its websites just moments ago today, July 19. Apollo 11 commander and NASA astronaut Neil Armstrong, was immortalized forever when he first set foot on the moon 44 years ago tomorrow (July 20, 1969), followed minutes later by the lunar module pilot, NASA astronaut Buzz Aldrin. The Saturn V rockets first stage was powered by a cluster of five F-1 engines – a technological marvel and the most powerful single-nozzle, liquid-fueled rocket engine ever developed. “44 years ago tomorrow Neil Armstrong stepped onto the moon, and now we have recovered a critical technological marvel that made it all possible,” says Bezos on his Expedition website today. Bezos, founder and Chief Executive Officer of the aerospace company Blue Origin and Amazon.com, originally announced the discovery and recovery of significant components of two flown F-1 engines amongst a field of twisted wreckage from the floor of the Atlantic Ocean in March of this year, aboard the Seabed Worker at Port Canaveral, Florida, along with a treasure trove of other major Saturn V components hauled up from a depth of almost 3 miles. “We brought back thrust chambers, gas generators, injectors, heat exchangers, turbines, fuel manifolds and dozens of other artifacts – all simply gorgeous and a striking testament to the Apollo program,” wrote Bezos in a update this morning, July 19. But until today, the engines exact identification remained elusive because of decades of severe seabed corrosion and their fiery, destructive end upon plunging and smashing unimpeded onto the ocean’s surface. Conservators from the Kansas Cosmosphere and Space Center in Hutchinson, Kansas worked painstakingly since March to identify the F-1 engine parts. “Today, I’m thrilled to share some exciting news. One of the conservators who was scanning the objects with a black light and a special lens filter has made a breakthrough discovery – “2044” – stenciled in black paint on the side of one of the massive thrust chambers, says Bezos. Apollo 11 launched to the Moon on July 16, 1969 from Launch Complex 39-A at the Kennedy Space Center in Florida. Armstrong and Aldrin landed on the Sea of Tranquility inside the Lunar Module. They took a single lunar excursion and spent 2 hours and 11 minutes as the first two men to walk on the moon. They stayed on the moon for a total of 21 hours and 36 minutes before blasting off for the journey back home to Earth. Armstrong suddenly passed away nearly a year ago on August 25, 2012 at age 82 – read my stories, here and here. Aldrin is still active and strenuously advocating for starting human expeditions to the Red Planet. The five F-1 engines used in the 138-foot-tall Saturn V first stage known as the S-IC generated 7.5 million pounds of liftoff thrust, or some 1.5 million pounds each. They stand 19 feet tall by 12 feet wide. Each one weighs over 18,000 pounds and was manufactured by Rocketdyne. The F-1 had more power than all three space shuttle main engines combined. They burned a mixture of liquid oxygen and kerosene fuel for two-and-one-half-minutes, carrying the Saturn V to an altitude of some 36 miles. Altogether, six Apollo Moon landing flights boosted by Saturn V’s sent a total of 12 humans on moon walking expeditions to Earth’s nearest neighbor during the 1960s and 1970s. “This is a big milestone for the project and the whole team couldn’t be more excited to share it with you all,” Bezos wrote. Bezos’ Blue Origin firm is also working to develop a commercial rocket and ‘space taxi’ to finally resume launching American astronauts back to low Earth orbit from American soil after a multi year gap. More than four decades have passed since the last humans traversed the lunar surface in December 1972 during NASA’s Apollo 17 moon landing mission. After all that time, the F-1 may yet live again. NASA is now working on an upgraded F-1 to power a future variant of the new SLS heavy lift booster under development and intended to launch humans aboard the new Orion crew capsule back to the Moon and to deep space destinations including Asteroids and Mars. NASA’s robotic exploration of the moon continues this year with the blastoff of the LADEE Lunar observatory on Sept. 6 from NASA’s Wallops Island facility in Virginia. NASA managers have announced a bold new plan to significantly alter and upgrade the goals and complexity of the 1st mission of the integrated Orion/Space Launch System (SLS) human exploration architecture – planned for blastoff in late 2017. The ambitious first flight, called Exploration Mission 1 (EM-1), would be targeted to send an unpiloted Orion spacecraft to a point more than 40,000 miles (70,000 kilometers) beyond the Moon as a forerunner supporting NASA’s new Asteroid Redirect Initiative – recently approved by the Obama Administration. The EM-1 flight will now serve as an elaborate harbinger to NASA’s likewise enhanced EM-2 mission, which would dispatch a crew of astronauts for up close investigation of a small Near Earth Asteroid relocated to the Moon’s vicinity. Until recently NASA’s plan had been to launch the first crewed Orion atop the 2nd SLS rocket in 2021 to a high orbit around the moon on the EM-2 mission, said NASA Associate Administrator Lori Garver in an prior interview with me at the Kennedy Space Center. The enhanced EM-1 flight would involve launching an unmanned Orion, fully integrated with the Block 1 SLS to a Deep Retrograde Orbit (DRO) near the moon, a stable orbit in the Earth-moon system where an asteroid could be moved to as early as 2021. Orion’s mission duration would be nearly tripled to 25 days from the original 10 days. “The EM-1 mission with include approximately nine days outbound, three to six days in deep retrograde orbit and nine days back,” Brandi Dean, NASA Johnson Space Center spokeswoman told Universe Today exclusively. The proposed much more technologically difficult EM-1 mission would allow for an exceptionally more vigorous work out and evaluation of the design of all flight systems for both Orion and SLS before risking a flight with humans aboard. A slew of additional thruster firings would exercise the engines to change orbital parameters outbound, around the moon and inbound for reentry. The current Deep Retrograde Orbit (DRO) plan includes several thruster firings from the Orion service module, including a powered lunar flyby, an insertion at DRO, an extraction maneuver from the DRO and a powered flyby on return to Earth. Orion would be outfitted with sensors to collect a wide variety of measurements to evaluate its operation in the harsh space environment. “EM-1 will have a compliment of both operational flight instrumentation and development flight instrumentation. This instrumentation suite gives us the ability to measure many attributes of system functionality and performance, including thermal, stress, displacement, acceleration, pressure and radiation,” Dean told me. The EM-1 flight has many years of planning and development ahead and further revisions prior to the 2017 liftoff are likely. “Final flight test objectives and the exact set of instrumentation required to meet those objectives is currently under development,” Dean explained. Orion is NASA’s next generation manned space vehicle following the retirement of NASA’s trio of Space Shuttles in 2011. The SLS launcher will be the most powerful and capable rocket ever built by humans – exceeding the liftoff thrust of the Apollo era Moon landing booster, the mighty Saturn V.
“We sent Apollo around the moon before we landed on it and tested the space shuttle’s landing performance before it ever returned from space.” said Dan Dumbacher, NASA’s deputy associate administrator for exploration systems development, in a statement. Both Orion and SLS are under active and accelerating development by NASA and its industrial partners. The 1st Orion capsule is slated to blast off on the unpiloted EFT-1 test flight in September 2014 atop a Delta IV Heavy rocket on a two orbit test flight to an altitude of 3,600 miles above Earth’s surface. It will then reenter Earth’s atmosphere at speeds of about 20,000 MPH (11 km/sec) and endure temperatures of 4,000 degrees Fahrenheit in a critical test designed to evaluate the performance of Orion’s heatshield and numerous spacecraft systems. Orion EFT-1 is already under construction at the Kennedy Space Center (KSC) by prime contractor Lockheed Martin – read my earlier story here. Integration and stacking tests with Orion’s emergency Launch Abort System are also in progress at KSC – details here. NASA says the SLS is also in the midst of a extensive review process called the Preliminary Design Review (PDR) to ensure that all launch vehicle components and systems will achieve the specified performance targets and be completed in time to meet the 2017 launch date. The PDR will be completed later this summer. NASA’s goal with Orion/SLS is to send humans to the Moon and other Deep Space destinations like Asteroids and Mars for the first time in over forty years since the final manned lunar landing by Apollo 17 back in 1972. NASA Headquarters will make a final decision on upgrading the EM-1 mission after extensive technical reviews this summer. What more can we say? This hilarious compilation of astronauts falling on the Moon put together by Joe Ivy comes from actual footage from the Apollo missions. Awesome. We all could use a little Carl Sagan in our day, and this latest installment in a new video series put together by Reid Gower might be just what you need for a little inspiration! Gower puts the words of Sagan to video and music, creating a stunning tribute to both Sagan himself and the Apollo program. Gower says he is “using social media to promote scientific literacy,” and this video is part 8 of “The Sagan Series” and he’s also created a companion set of videos, “The Feynman Series,” using the words of physicist Richard Feynman. This video is based on a chapter of Sagan’s monumental book Pale Blue Dot: A Vision of the Human Future in Space, a book that has inspired and motivated many people, including me. In this video, Sagan discusses the triumph of landing on the Moon, as well as pointing out the true political motivations for the Apollo missions, and their often overlooked benefits. China’s human spaceflight program is gearing up to take a highly significant “Leap forward in Space” after their “Tiangong 1” prototype space station was rolled out to the remote Gobi desert launch pad at the countries Jiuquan Satellite Launching Center in Gansu Province in anticipation of blastoff sometime this week. Space officials from the Chinese Manned Space Engineering Office have now confirmed that liftoff of the 8.5 ton Tiangong 1 human rated module atop a Long March CZ-IIF booster rocket is slated to take place during a launch window that extends from Sept. 27 to Sept. 30. The launch was delayed a few days after the recent launch failure of a similar Chinese rocket, the Long March IIC. China’s burgeoning space efforts come directly on the heels of the voluntary US shutdown of the Space Shuttle program, thereby dismantling all US capability to launch humans into space from American soil for several years until about 2014 at a minimum. The US manned spaceflight capability gap will be stretched out even further if NASA’s budget for commercial space taxis and the newly proposed SLS launch system is cut by political leaders in Washington, DC. On Sept. 20, the integrated Long March rocket and Tiangong module were wheeled out of China’s VAB while sitting on top of the Mobile Launch Platform and transferred to the launch gantry at Jiuguan. The goal of the Tiangong 1 mission is to carry out China’s first human spaceflight related rendezvous and docking mission and to demonstrate that Chinese space engineers have mastered the complicated technology required for a successful outcome. These skills are akin in complexity to NASA’s Gemini manned program of the 1960’s which paved the way for NASA’s Apollo missions and led directly to the first manned landing on the moon in 1969 by Apollo 11. Chinas stated goal is to construct a 60 ton Skylab sized space station in earth orbit by 2020. Check out this CCTV video for further details and imagery of the Chinese space hardware which shows the how China will expand the reach and influence of their space program. View this Chinese video from NDTV for a glimpse at Chinas long range Space Station plans. The 40 foot long Tiangong 1 space platform is unmanned and will serve as the docking target for China’s manned Shenzhou capsules in a series of stepping stone learning flights. It is solar powered and equipped to operate in a man-tended mode for short duration missions and in an unmanned mode over the long term. The initial rendezvous and docking mission will be conducted by the Shenzhou 8 spacecraft, which will fly in an unmanned configuration for the first docking test. 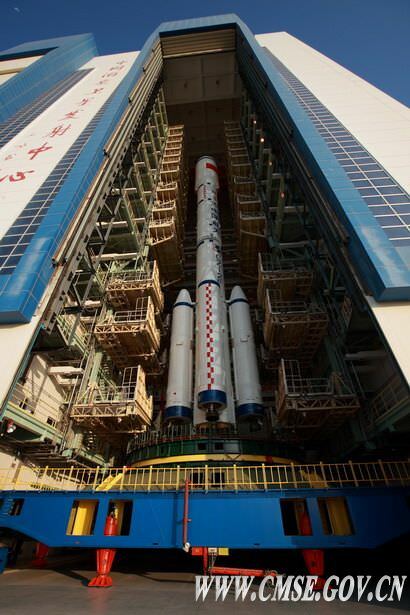 Shenzhou 8 is scheduled to soar to space before the end of 2011. If successful, China plans to quickly follow up with the launch of two manned Shenzhou flights to dock at Tiangong 1 during 2012 – namely Shenzhou 9 & Shenzhou 10. The multi astronaut chinese crews would float into Tiangong 1 and remain on board for a short duration period of a few days or weeks. The crew would conduct medical, space science and technology tests and experiments. China’s first female astronaut may be selected to fly as a crew member on one of the two Shenzhou flights in 2012. Meanwhile, all American astronauts will be completely dependent on the Russian Soyuz capsule for trips to the International Space Station. Russia is still working to correct the third stage malfunction which doomed the recent Progress cargo resupply launch and put a halt to Soyuz launches. Engineers and technicians are in the process of checking out all Tiangong 1 systems and preliminary weather reports from Chinese media appear favorable for launch.